Google provides extremely useful Search console (webmaster tools) to perform various activities and view stats of your web site. Here are some reasons why you should verify ownership of your web site in google search console. It lets you remove a page from google index. You can view average time google is spending in downloading a page. This tells you the speed of you web site. It tells you how many pages google has indexed from your website. It lets you upload and manage sitemaps. Overall it lets you monitor and manage health of your site proactively. 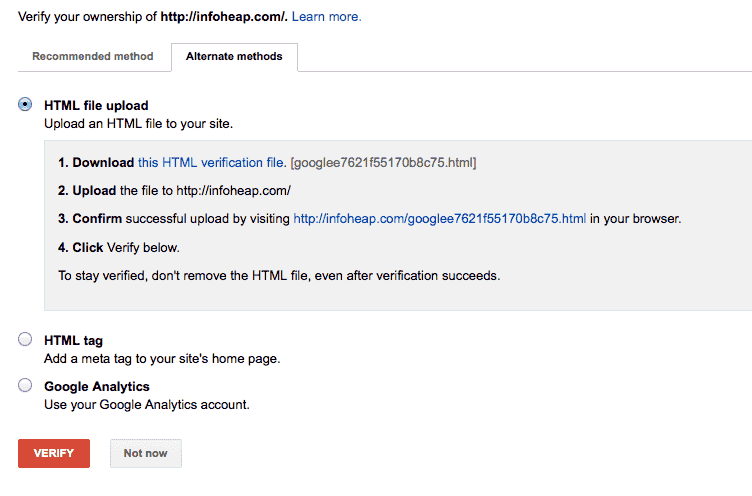 Here are the steps to verify ownership of you site in google webmaster tools. Login to http://www.google.com/webmasters/tools/ if it is first time login, you will see a add site box. Otherwise look for add site button and click on it. Enter your site name in the box (e.g. infoheap.com) and click “Add a site”. You can also verify www.infoheap.com once you have verified infoheap.com. Its a good idea to verify both domains as it lets you pick a preferred domain later in webmaster tools site configuration menu. On next screen Google shows you two methods tabs. 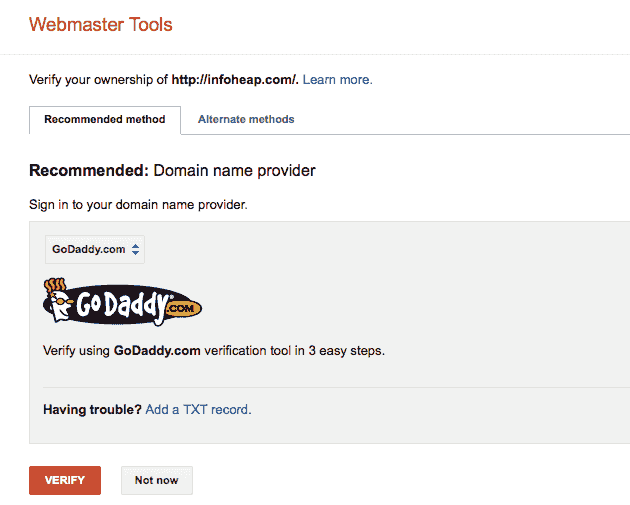 First tab has option to use domain name provider (Here Google automatically detected the provider as Godaddy). Second tab window has alternate methods like HTML file upload, HTML tag, Google Analytics. We’ll use the domain provider method for the purpose this article. But you can choose any of these methods. 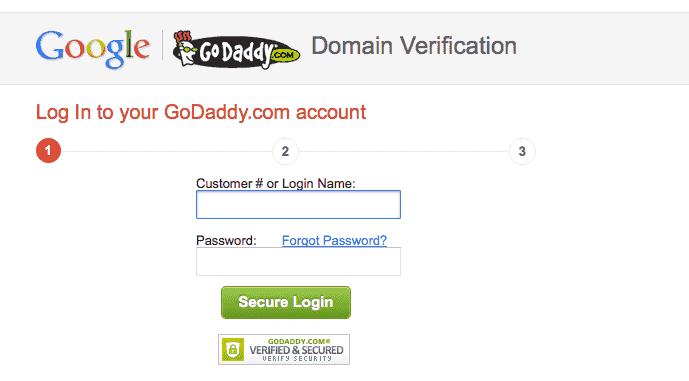 Click on Godaddy in first tab and follow the steps as shown in following screens. You can provide other users access to a specific domain in google webmaster tools. That way you don’t have to verify ownership for each webmaster in your team.